CNC bridge saw with 370° rotating and 0°- 90° tilting head. Cuts from CAD, pieces machined from solid and technology to minimize overcuts. 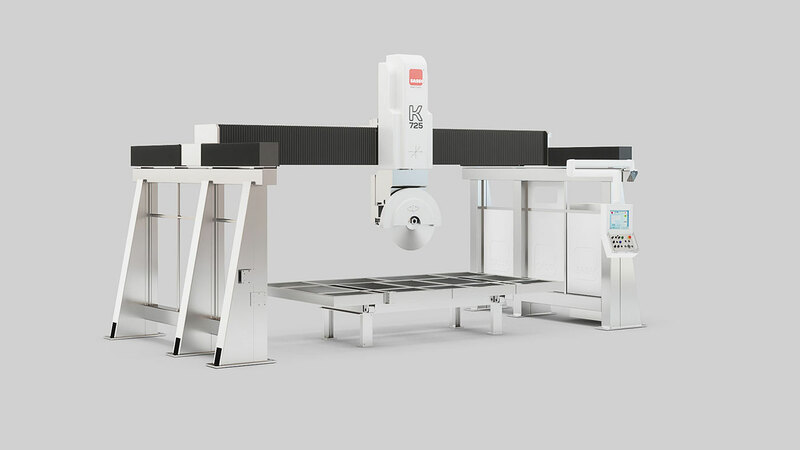 The K725 is the perfect solution to disk cut up to 725 mm of diameter and better exploit the 500 mm of trajectory of the Z axis. Thanks to the touch screen PC and the SASSO software, the machine is very easy to program, and can even generate cutting programs by itself, using the dxf files for kitchen tops and 2D. A 5-axis that anyone can use. The best compromise of power, effectiveness, precision, versatility. The working abilities of the K725 are truly unlimited. With a programming simplicity that surprises.